A big shout out to all the veterans that have served our country! Thank you! We learned about veterans this week. In Reader's Workshop, our friends worked really hard reading their books! They are using the picture and the first letter. They are also thinking about what they are reading to see if makes sense. They are enjoying the learning process! We will continue to practice our other strategies as well: looking at the picture while we read, trading out books, building stamina, practicing turning and talking. In Writer's Workshop, we focused on writing across the pages and started to use our sight words to formulate sentences that match our story. In Math, we finished our first unit and took our first unit test this week! The children did great! In Phonics, we practiced letter sounds and learned the sight words "an" and "look", please practice these words at home. Our letters of the week were "p" and "j". In Science, we started our unit on habitats. We learned all about frogs and their habitat. Our choice centers were focused around frogs. 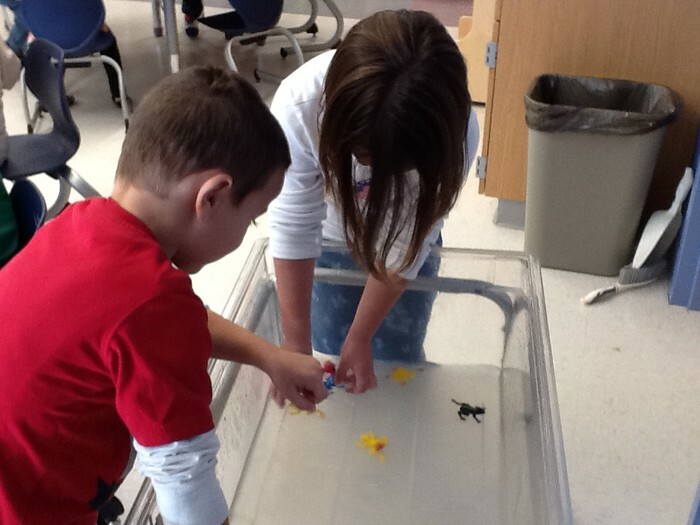 We explored frogs and their habitat in the water table. We re-enacted frog stories in our drama station. We worked on the life cycle of a frog in the art center. Our block center was a real challenge for our friends. They had to use blocks to fill in an outline of a frog or tadpole and then had to record their information on a data sheet. It was a great week! Can you believe it is the middle of November ALREADY? In Reader's Workshop, we are going to continue to look at the picture AND the first letter of the word to see if it makes sense! We will continue to practice our other strategies as well: looking at the picture while we read, trading out books, practicing turning and talking. In Writer's Workshop, we will continue to add details, action, speech bubbles and sentences to our writing this week. In Math, we will start our next units on shapes! I am so proud of our learners!! In Phonics, we will be practicing letter sounds and learning the sight words "We" and "to", please practice these words at home. Our letter of the week will be "H",and "K". In Science, we will continue our habitat unit. This week our focus will be on fish and their habitat. The children will use the water table to explore fish and their habitat. Our drama center will become a woodland area where the children can act our stories that we have read in class. The STEM area will be used for children to study the body structures of a fish. In the art area, the children will draw up their research about Leo Lionni and create their own artwork using Leo Lionni as an inspiration. Great job reading with your child! Thank you for the book orders. I placed the order on November 10th and they should be here shortly. Thank you for your continued support. As you know the seasons are changing and the temperatures are cooling off. I realized that the extra set of clothes that I have in class are mostly summer/fall clothes that need an update. I sent home the baggies of the change of clothes we had for your child on Friday, please replace the clothes with warmer clothes. Please make sure to add a complete set of clothes! Thank you! It is so hard to believe that it is the middle of November. Your children are making great gains in their learning and I am so proud of all of their hard work. Things are really clicking with reading and writing and we are ready to start to add text to our writing to go along with our drawings. We have been working so hard to learn our sight words and can find them in books we are reading and signs and messages. Thank you for the classroom donations. They come in so handy - especially those Clorox wipes! 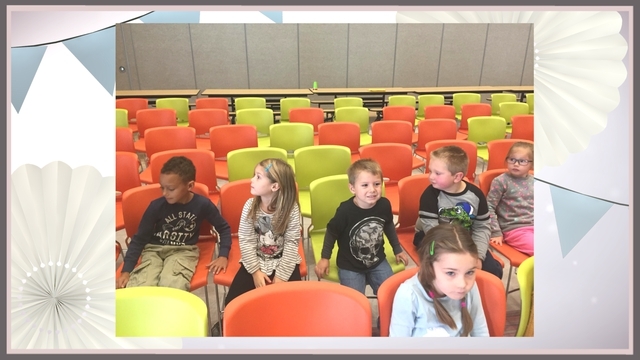 Picture retakes are Nov. 17th, and there is also a PTO meeting at 6:00 on on November 15th. If you are interested in helping to raise funds for our school, the PTO is a great organization! Check it out! Parent teacher conferences will be held in December, but if you have any questions or concerns, please contact me. I am happy to meet any time! We have welcomed a new friend Brysen to our class. In writers workshop we are writing in the moment true stories. I am hoping that you could send in a picture or two for the students to remember a moment or activity that they could write about. The pictures will be returned to you. Please label the students belongings. There are too many things for me to remember who's things belong to who. Our lost and found is over flowing. If you have a chance come and take a look. PTO meeting is this Tuesday, November 15th at 6pm. Please come see what it is all about. It is a great way to get involved. It would be great if you get achance to read to your son / daughter and practice sight words and letters and letter sounds. After having our math unit test this week. We can all use practice writing numbers 0-10. Thank you for you support. Picture retakes are November 17th. We do have an issue of head lice. Please be checking your child's hair as often as you can. I will be having them keep their coats and hats in their backpacks. Our room is vacuumed each day. I try to keep things clean. This is a group effort to keep the problem at bay. If you need any assistance please let me know. Our klorox wipes are almost out. If you could donate anything at this time wipes are a good thing. Another reminder snacks are to be provided from home. Thanks for those who have sent in extra snacks for the class. I am really excited to be teaching your children! They are making great progress. Thanks for your continued support. Miss Truehart and Selene and Blake are matching cubes to the frogs number. Playing with frogs and tadpoles. Students are tracing and writing numbers. Thank you for all that you do! Keep up the great work!